Solid wooden beams rest on top of dry-stone walls to support a balcony that cantilevers to shelter a parking spot for a DeLorean at this house designed by Hyde + Hyde for a site on the Gower Peninsula in south Wales. 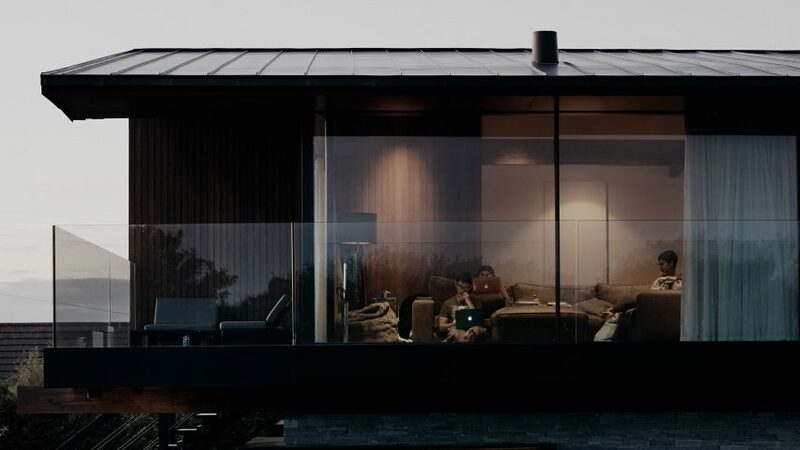 Swansea-based architecture office Hyde + Hyde created Silver House for a family who relocated to Wales from London in search of a peaceful life and a closer connection with nature. The site chosen for the house is high up on a limestone cliff with views towards Oxwich Point and the Bristol Channel. The building's design seeks to optimise exposure to the views while referencing the region's vernacular architecture. The layered elevations have a horizontal emphasis, with bands of different materials breaking up the overall volume. A stone plinth containing bedrooms at ground-floor level provides a solid base for the timber-clad upper storey. "The material language of the ground floor responds to the medieval tradition of dry stone walling found in the area," the architects pointed out. "Portal windows to the ground floor bedrooms cantilever over a reflecting pool that gathers rainwater from the roofs above." The construction of local agricultural buildings informed the use of exposed wooden beams set on top of the stone wall, which support the upper level as it extends out to shelter a car port for a DeLorean and Land Rover underneath. A sound-recording studio located in the basement receives natural light through the reflecting pool flanking the house. The first floor accommodates the main living spaces and a master bedroom. At this level, the building separates into two distinct forms with mono-pitched roofs that respond to the driving winds and rain coming from the channel. The division of the upper storey is emphasised by the central placement of an external staircase that ascends from a paved outdoor patio and deck to an entrance between the two first-floor spaces. 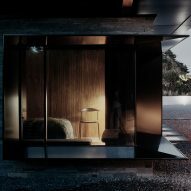 The bedroom volume is lined along one side with a full-height window facing west, while the south-facing living area and adjoining balcony is sheltered beneath a sloping roof that points towards the ocean. "The mono-pitch roof falls downwards with confidence and speaks to the wind that will confront its facade almost daily," the studio added. "The building's personality projects a subtle awareness of its context, not just topographical but nautical and even meteorological." Internally, the house is configured to achieve optimal exposure to the changing daylight conditions throughout the day. A kitchen at the east end of the upper storey receives morning light, which passes along the south-facing living area before providing a view of the sunset from the master bedroom. Silver House was among the winners of the RIBA Wales Awards 2017, with the judges describing it as "a very elegant and thoughtful piece of architecture". "It has great conceptual clarity, it is rich with ideas without being over burdened with them," the jury continued. "While it is rigorous in resolution it retains an air of easiness and is wholly comfortable in its context." Hyde + Hyde was established by Kay and Kristian Hyde in California in 2006. They have since returned to Kristian's home country of Wales, where their studio works on projects locally and across Europe. The office was behind the design of a house on the Welsh coast with a cedar-clad balcony stretching all the way across one of its facades to provide views of the ocean.